March is a fantastic month, 1 – because it’s the month I was born in so yassss PISCES, and 2 – because it truly brings MADNESS. People begin to go mad as soon as the first warm day hits. The rooftop bars open, outdoor seating is available and people frolic through the park like it’s June. It is amazing to see how madness spreads with one warm day of weather. When I think about the word madness, I immediately think about sports teams and being excited about something. “March Madness” allows people to embrace their college basketball teams. 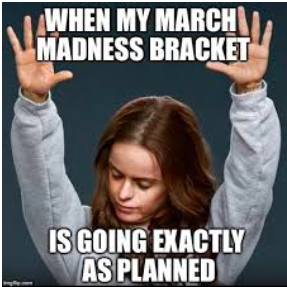 Whether that’s a college student attending the games, an adult obnoxiously cheering for their team yelling at the TV, or a colleague participating in the brackets at work. The Madness of sports as a whole brings people together. What are you excited for this March? Which teams are you rooting for this season? Still go to a rooftop bar, eat wings, drink beer and embrace the MADNESS this month brings!